The visual aspect of prices is essential in the retail industry. Better price visuals can significantly impact the demand and therefore the profit too. In order to maximize profit, the price should be displayed in small size, on the bottom left of the label for offline retail. In online retail, the price also needs to appear as small as possible and therefore the display requirements are more or less the same compared to its offline counterpart. Every price should seem as small as possible and since consumers need to be driven onto buying, the have to feel that they are getting a good deal. For example, in the case of promotions, if the pre-promotional price is over 100 (say $150), it is more effective to indicate the pre-promotional price and to also display the amount of the price cut in monetary values (for example $50 in savings). On the other hand, if the pre-promotional price is lower than $100 (for instance $60), the reduction should be displayed in percentages (for example, save 20%). In both of these instances, the consumer perceives the price cut to be higher and the final price lower. As a guiding principle, price visuals intend to let customers perceive that the price is smaller than it is in reality. If customers do indeed perceive prices in this way, the demand for the product will be higher and therefore the profit will be larger. The price should be written in a font that minimizes the length of the price line, be of a small size and displayed the bottom left of the label. On the contrary, in certain situations, the price needs to be displayed in large format in order to deliver a specific message, such as announcing store promotions, to attract the customer. This strategy is risky however since the price may appear to be higher, and therefore according to classical economics the demand could be lower. In order to maximize sales, the first step is to use a small font size. The experiment of Coulter & Coulter in 2005 emphasized that “size does matter”. The human brain associates magnitude with quantity. The same price can look very different depending on whether it is displayed in a large size or in a small size. Displaying a price that is small-sized makes the actual price seem smaller and therefore improves profit. When the price is displayed in a size that is as small as possible but remains easily readable for the customer, the next step consists of choosing a font for the price. First, digits need to be close to each other. While we established with Coulter and Coulter that “size does matter”, the length of the price display matters too; and it is therefore necessary to reduce this length as much as possible. For example, in some countries, there is a thousands separator for numbers (like in $1,300.00 for $1300); the “,” increases the length of the price and therefore should be removed since it makes the price seem bigger. According to Meier and Robinson, the position of the price could also change its perception. In school, all of us learn to write numbers in an increasing order from left to right. Therefore if the price of any given good is placed on the right, experience shows that in this case, it is as if one perceives there to be an imaginary smaller price on the left before seeing the actual price on the right. Consequently, the price on the right is perceived as high because it is located at the “end” of an imaginary price. On the contrary, if the price is placed on the left, it is perceived to be at the beginning of the line and thus appears smaller. For the same reason, the price should be placed on the bottom of the product label. Moreover, displaying prices on the bottom has now become a standard procedure in the retail industry, and any deviation from this rule is confusing for the consumer. Displaying the initial pre-promotional price together with the price cut amount is a well-known strategy in the retail industry: it increases demand since the consumer feels that he is getting a good deal. Two of the largest e-commerce companies in the world, namely Amazon and Groupon, display their prices along with the initial higher pre-promotional reference price. In fact, research carried out by Urbany et al demonstrated that consumers are significantly more likely to buy when the initial pre-promotional price is higher when examined alongside the savings generated from the purchase. The incentive for buying is simple - consumers feel that they are making a worthy purchase. 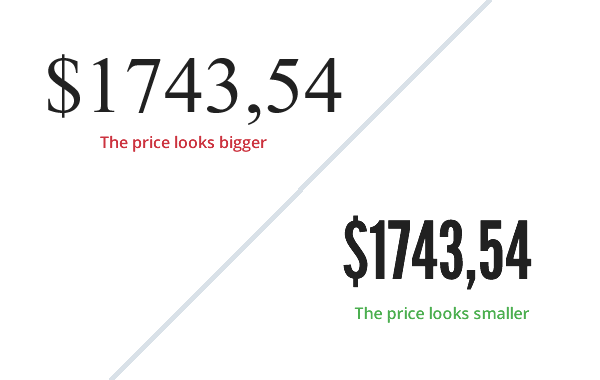 In order to maximize the effect of the initial price, the “real” after-discount price needs to follow the rules of font, size and position as described above. The price needs to be written in a smaller size for example. Pre-promotional reference pricing is widely used for sales promotions and when using such pricing the retailer may also want to display the amount of price cut. Here, one can choose between two strategies: displaying the amount of the cut in monetary value (“save $150”) or in percentage of savings (“save 20 %”). Between these two methods, it is best to choose one which seems be the least expensive for the customer and therefore the one with the most digits. If the pre-promotional price is under 100, the discount should be displayed in percentages, while if it is more than 100, one should show the discount in terms of monetary value instead. If the price is $50, having a $10 discount or a 20 % discount is exactly the same, but 20 % seems more significant than $10 and will therefore generate more customer demand. On the other hand, if the price is $200, giving a $40 discount or a 20 % discount is also the same, but in this case $40 is perceived by the customer to be a better deal. The currency symbol can come before or after the numerical price value and this varies from one currency to another. . For instance, in the USA, the price is usually displayed with the currency symbol before the number: $1000. In Europe on the other hand, the euro symbol can come before or after the number: 1000€ or €1000. Most countries use the prefixing style, whereby the currency symbol is displayed in front of the price. This comes from history, when there were different way to express a price. We have 100 ¢ = $1, so we can write $1.5 as $ 1 50 ¢. Therefore, using the “¢” symbol after the price automatically places the “$” symbol before the price.